(2009 SeSa Trade Angel) A new chief's first decision is the most difficult to make. Coming up out of the chief's den was like swimming up out of deep, still water. Windburn stepped out of the arching hometree doorway and filled his lungs with cold air. The sleeting rain had stopped for the moment, but the evening was heavy with the promise of more. He filled his lungs with the damp, chill air, but the sensation that he was drowning refused to leave him. His mother, Easysinger, was dead. It had been nearly two full nights since that news had reached the Holt, preceding the spear-litter bearing her remains by many hours. It seemed as if the news was still gut-fresh; at the same time, it seemed as if he had been living in this bubble of horror forever. He tried not to hear the weeping he had left behind him in his mother's den, where his uncle, his sister and his cousin were all huddled, each inconsolable in their shared loss. Everywhere else, silence hung like a miasma about the Holt. His mother was gone. It was unthinkable. There was no one alive in the tribe who could remember a time before Easysinger was chieftess. Even eldest-elder Kestrel had grown up with Easysinger as the only chief she had ever known. There had been no chief but Easysinger; the rest were but distant history, fragments of send-stories shared out with dreamberries down the generations. Easysinger was dead. It was easier to accept fish falling from the skies like rain, or the Braided River flowing licks of fire than it was to accept the loss of his chieftess-mother. Windburn was no longer sure of anything. His world had changed, and not even the earth beneath his feet felt steady or sound. Windburn leaned against the polished, ancient wood of the arching hometree doorway. After a moment, he pulled a piece of jewelry out from within his vest, and gazed at it sightlessly as he held it in his hands. The silver chief�s torc was deceptively heavy in his hands. The chip of amber still winked in the eye of the wolf�s head which capped one end; he�d had to clean away his mother�s blood from blue gem inlay of the torc�s other cap. He traced the sending-star design reverently now with a fingertip, finding the broken circle of the torc�s design bitterly appriopriate. Windburn tucked the torc back into his vest as he turned to see Snowfall sitting on a shaped-burl bench along the curve of the hometree. She was bundled in a rabbit-fur quilt, her pale hair almost aglow in the storm-dark of the night. 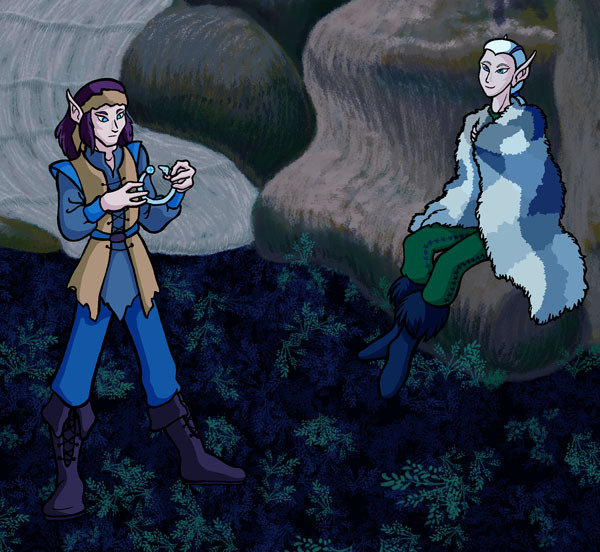 The tribe's Howlkeeper held aside part of the fur quilt in wordless invitation, and Windburn found himself sitting down beside her almost before he was aware of responding. The quilt was warm with her shared body-heat, and they leaned against one another silently, sharing the heat of their bodies against the chill. Snowfall said nothing for a time. Windburn knew what she was thinking � she feared that Blacksnake was not coming back. It wasn't unusual for a lifemate to chase after death in the shock of losing their Recognized. When the spirit-bear had killed Easysinger, Blacksnake had left the rest of his hunting party behind and chased after it. There had been no sign or send from his father since. �Farscout will find my father and bring him home,� Windburn said finally, unable to stomach his tribemate's polite silence. �My father will be back. You know he will be. He's too stubborn to die.� It came as a strange comfort to speak those words of faith in his father, to realize that there was something left that he still knew gut-deep he could believe in when all of the rest of the world had proven false. Blacksnake would not choose to die � in that, Windburn could believe. His father was too willful and difficult to choose to die � he would come home again, to a home where everything else was changed. �We cannot wait too much longer for him,� Snowfall said, as gently as she could. Windburn refused to look at his elder, knowing that the Howlkeeper was right in that brutal truth � decay would not give his mother the grace to wait much longer for her lifemate's return. It was not high summer, at least � the last-breath-of-winter chill had bought them a little extra time to wait. �If Blacksnake cannot find his way home to us tonight, it would be disrespectful to your mother to wait another day,� Snowfall continued. �We wait for my father,� Windburn repeated, feeling the burden of that like some great dank, uneasy weight, settling on his shoulders. Snowfall turned her head to look at Windburn, her pale eyes somber and serene. The rain began again, almost a mist at first, then increasing to a steady patter against the ground and against the budding hometree leaves. Feeling his companion's waiting silence, Windburn finally turned his head to look at her. Windburn scowled at her words, and at the steady faith that underlay them. �My father will disagree with that,� he muttered aloud. Snowfall's level stare didn't falter. �Do you doubt yourself?� she asked, as gentle and relentless as the rain. Snowfall's gaze flickered for a moment. �But...� she supplied, having heard that objection in Windburn's tone. Windburn shrugged. �My father. Blacksnake served for an oak's age or more as my mother's right hand. He will challenge me when he returns to the Holt. You know he will. My father will never show throat. Not to me. And I...� Windburn shrugged again, not willing to voice those dark thoughts. Windburn had never considered himself to be ambitious. Certainly he had never wanted to inherit the chieftaincy. But... if he committed himself to stepping up to the duty his mother had left him... and if his father challenged him... Windburn felt the anger that roiled, deep inside himself, and feared that if it came to a challenge fight, he would find himself equally unable to show throat. �Do they really?� Windburn asked; he regretted the question instantly, finding the words reeking with self-pity. He knew that his kin were waiting on him to put on the chief�s torc. Windburn sensed that evanescent spider-silk web of relationships into which he�d suddenly shifted sideways into the center. He felt the currents of those tribal expectations whispering in his blood, gut-deep and visceral. He knew what he was supposed to do. He just feared the doing of it. �Not everyone will feel as you do,� Windburn said. Windburn took a deep breath and studied his elder in the dim evening light. He could not discount her words or wisdom. Snowfall was the tribe's Howlkeeper. Above all others, she knew they tribe's history � and by knowing that so well, she was, perhaps, closest to knowing the tribe's collective soul. **The tribe needs no more grief, Howlkeeper,** he locksent firmly. **You will not give it to us,** Snowfall responded, as a knowing smile touched her lips. Windburn closed his eyes. He filled his lungs again with the cold air. And for a moment, at least � he felt a dawning moment of clarity, as though he'd broken through to the surface, after a difficult swim. He rose to his feet and pulled the torc from within the folds of his vest. The kiss of cold metal around his neck was bracing as he put it on.